LOS ANGELES, California — September 19, 2016 — Blix today released version 3.0 of their app, which, among many speed and efficiency improvements, adds a long-awaited feature — video. Using version 3.0, users can take, add filters to, and upload videos to Blix. As with photos, people can share their videos with everyone within a few miles — not just their friends. Instead of spending endless time scrolling through your friends’ vacation photos, Blix encourages people to get outside and do something in real life by telling them what’s going on. Using Blix, people can easily connect with others in their community, and see what’s going on. Videos improve on this experience, adding a new depth of moments than can be left behind. Posting a video on Blix is the same as a photo — it is left behind as a moment in time — not just data on your phone. Anyone and everyone who comes close to this moment can discover it, whether it be an awesome new restaurant or a block party. With the addition of video, posts on Blix no longer need to be frozen moments — posts can now have a lot more life in them. LOS ANGELES, California — September 3, 2016 — Blix today began putting the finishing touches on iPhone and iPod app version 3.0. This version boasts many performance improvements, as well as a long-awaited feature — video. Using the new version, users will be able to take, edit, and upload videos to Blix. As with photos, people can share their videos with everyone within a few miles — not just their friends. Instead of spending endless time scrolling through your friends’ vacation photos, Blix encourages people to get outside and do something in real life by telling them what’s going on. Using Blix, people can easily connect with others in their community, and see what’s going on. With the addition of video, posts on Blix will no longer need to be frozen moments — posts are about to get lot more life. LOS ANGELES, California — August 18, 2016 — Blix today released a new version of their app for iPhone and iPod Touch making performance improvements. Blix is a simple way for people to see what’s happening around them, from special events like parties and concerts to awesome food trucks or great hikes to take. Using Blix, people can easily connect with others in their community, and see what’s going on. 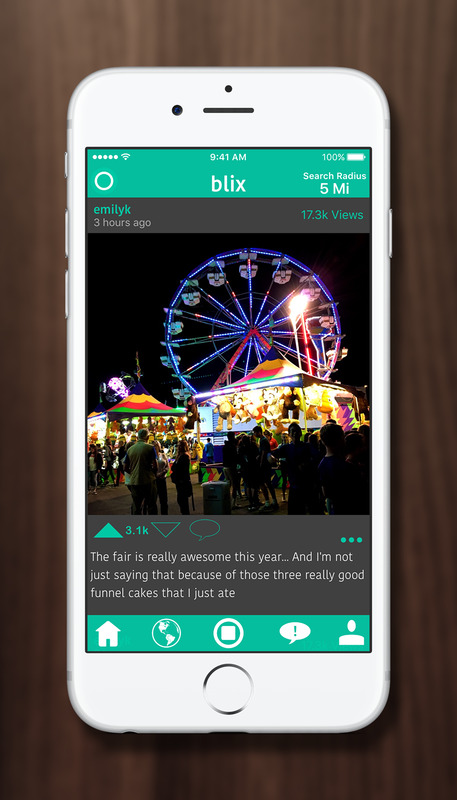 Using Blix, people can share moments with everyone within a few miles — not just their friends. Instead of spending endless time scrolling through your friends’ vacation photos, Blix encourages people to get outside and do something in real life by telling them what’s going on. Posting a photo on Blix leaves the picture behind as a moment in time — not just data on your phone. Anyone and everyone who comes close to this moment can discover it, whether it be an awesome new restaurant or a block party.